Two major upgrades offered to all of Apple's new MacBook lineup are updated SSDs and native USB 3.0 support. The same updated SSD is present across all of Apple's lineup: from the MacBook Air to the next-gen MacBook Pro. Based on the model number in Apple's System Report I'd guess my review sample features a Samsung based drive. Toshiba was a secondary source in the past, and with its announcement of a 6Gbps controller I wouldn't be surprised to find that in systems as well. Apple claims the new SSD is capable of up to 500MB/s read performance. I ran a few tests using Quick Bench to validate Apple's claims. In general it looks like read speed approaches 500MB/s, while sequential writes are closer to 400MB/s. I don't want to draw any conclusions based on the random data just yet because it's like Quick Bench is using a 100% LBA span for these tests, while I typically run at a more limited LBA span for my random tests. Note, the SSD in the next-gen MacBook Pro is physically removable similar to the drive in the MacBook Air. The drives aren't interchangeable however and I'm not sure if the two even use the same physical interface. 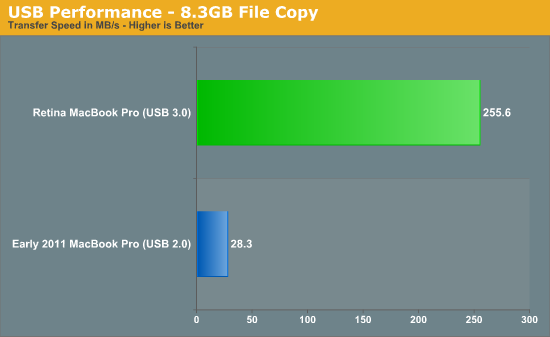 USB 3.0 performance is much improved over the previous generation MacBook Pro. 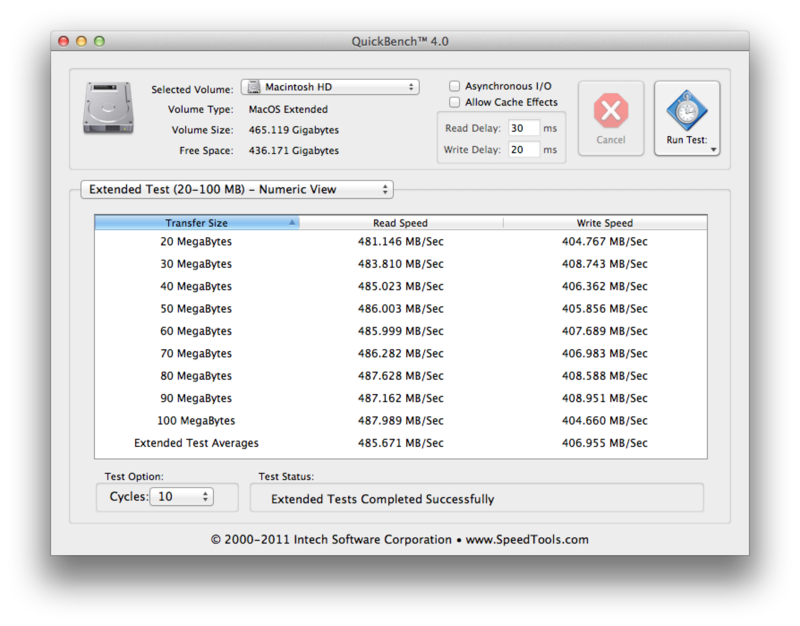 I used an Apricorn SATA to USB 3.0 adapter to measure copy time to/from a 512GB OCZ Vertex 4 SSD. The performance gap between USB 2.0 and 3.0 is nothing short of significant. More details on the next-generation MacBook Pro as we make it through our review. Judging by the pictures Apple showed today, the SSD seems to be a separate PCB, just like in MBA, and hence upgradeable.